The paintings of Jonathan Lasker and John Noel Smith truly stand out from those of their fellow painters, occupying a distinguished position in the world of contemporary art. These are two painters whose work has changed somewhat in appearance over the years – I am thinking of Lasker’s much reproduced Moody Room (1977) and other paintings from that period and Smith’s Tower Series of the 1980s – but their core discourse has not. Like Giorgio Morandi whom he cites as an influence, with his “concentrated, consistent parameters”, Lasker has no problem with the fact that his artistic agenda has not altered significantly over the years. Agilely working within his chosen ambit, his paintings manage to retain a remarkable degree of individuality. Likewise, Smith has been working in series for some time and while there are of course shifts in his concerns as he embarks on a new body of work, there remains a clear thread running through works that may appear diverse in style but preserve their unique identity and coherence. Though there seems an apparent conversion from representation to abstraction, both artists have always only been concerned with how what Smith refers to as his “flotilla of elements” create the complex, anxious spaces we associate with these painters. Lasker and Smith share an eloquent articulation that reveals some influence of the modernist tradition, while at the same time subjecting it to their analysis. Both artists make enigmatic works of enduring energy that combine a great love of texture and formal flexibility, manipulating notions of foreground and background, surface and depth. Exerting a masterful control over the process, Lasker and Smith allow chance too to play its part. The intuitive gestural mark is counterbalanced by a cerebral constructive undertaking that creates not only a sense of authenticity but also one of sophistication and playfulness. Ultimately their paintings are about the act of painting itself, and while infinitely playful, Lasker and Smith remain two of the most serious protagonists in contemporary art. The first time I was lucky enough to be confronted with a Lasker painting was in the late 1980s in New York; I came away from this first viewing puzzled and uncertain as to what was going on, asking myself were these compelling works even finished! Though I had spent the day before with my US Abstract Expressionist heroes at MoMA, these new works by Lasker had largely blotted out that experience and were stuck in my head demanding attention. I visited the gallery three more times; this was perhaps the first contemporary painting that I had encountered that clearly belonged in both the abstract and conceptual art camps. Smith’s paintings captivate, challenge and engage us in similar vein. Armin Zweite refers to Lasker’s “potential for resistance… this lies in the entaglement of aspects that seem to exclude themselves, per se” and it may be this very questioning of assimilation in these paintings which engages us; Lasker admits that his painting defies “normal expectations of how people are supposed to paint”. Caoimhín Mac Giolla Léith’s 2002 essay Emblems of Estrangement for Smith’s mid-career survey exhibition at Ireland’s Royal Hibernian Academy makes a similar point: “we may fi nd that symbolic content or meaning is inevitably subordinated… we may find these works inscrutable, rebarbative or overwhelming… they resist any easy assimilation.” He suggests that it is in fact “this thwarted access” which is fundamental to an understanding of these works. In a way, both of these artists emerged as painters just as painting had been declared dead and so can be seen, certainly in their early years, as outsiders in the contemporary art world. Lasker was a student at Cal Arts in the 1970s, a time when Conceptualism was the new theoretical kid on the block and to be a painter was to take a brave stance. Lasker remarks: “In a way it was good for me, because it forced me to shape my reasons for making paintings. It also forced me to make paintings that had reasons for being paintings. So I think, in a way it pushed me in a good direction, although the experience was alienating.” Lasker’s challenge was to make paintings that were self-reflexive; work that stressed itself as a material object, yet also engaged the metaphor of picture making. Smith too while in Berlin was making work with quite different concerns to that of his German painter colleagues; with Markus Lüpertz, Georg Baselitz, Jörg Immendorff, A R Penck, Rainer Fetting, Walter Dahn and others in one Neo-expressionist or Neue Wilden camp, and Albert Oehlen, Werner Büttner and Martin Kippenberger in another distinct grouping of infants terribles. While Lasker and Smith take two different routes, they are dealing with different elaborations of a general problematic. They brightly challenge us to join with them in experiencing the inherent tension of their language, both introducing elements that lead to a sort of fragmentation of the aesthetic experience. Lasker breaks up language into its constituent parts, whereas Smith seems to be more interested in the glue that holds these parts together. Neither artist proposes particular associations or metaphors, and while they clearly adhere to certain rules their approach is not systems based like Sol LeWitt and others. For both artists, a dialectic of the intuitive and the formal creates a dialogue that results in a mark-making which is at the same time conscious and unconscious in that automatic marks are consciously placed in predetermined areas. These recurring motifs act as structural components, performing formal, aesthetic roles but have no function as signifi ers of meaning. Lasker has discussed the issue of signs and marks in relation to his work: “The most exciting paintings for me are the ones where you cannot really specifically discuss the sign, but you know you are dealing with something which marks something.” This ambiguity and paradox in the exploration of the uncertain boundaries between sign and object is something surely Lasker owes in some part to the teaching of the influential Richard Artschwager at Cal Arts. Whereas Robert Rauschenberg and Jasper Johns famously through their introduction of material from outside of painting challenged the purity of both painting and our experience, Lasker and Smith achieve this through painterly means. Use of colour is a further link between Lasker and Smith with their restricted palette (with colours often seeming to work against each other formally) and use of fl at areas of colour; their strong graphic sense also brings to mind artists as diverse as Piet Mondrian and Robert Motherwell. Impasto, often stucco-like, too is important to both artists. In Smith’s new ‘fold’ paintings it serves to create what appears as a sort of powerful, spiritual discordant wound, a dynamic antithesis to the quiescent fi eld. In Lasker’s case, his cast-like gestural, sculptural forms are placed with deceptive, almost destructive randomness into a new ordered context. As Lasker remarks: “my works can become dialectically self-destructive, such as when I set up a pattern and then disrupt it with an aggressive painting gesture”. It is as if both artists are attempting to test their use of language by rupturing it. The oil studies by Lasker in this exhibition provide an opportunity to enjoy a vital stage in this artist’s creative process. Often starting with a small drawing, Lasker then creates a study in oil which may later become a larger painting. Changes in composition and colour are frequently introduced as the image is transferred to a larger plane. His approach is work intensive and he famously only produces six to ten large paintings annually. Similarily Smith’s labour-intensive process has been described by Ciarán Bennett: “paintings often take months to complete… layer upon layer, surface upon surface… a process which by contemporary standards is almost medieval… allows him to control every aspect of the process and determine the exact nature of the balances and interfaces of the eventual surface”. Yet neither artist’s paintings possess any sense of being overworked, on the contrary they appear to have been effortlessly brought forth. The work of these two artists can be broadly characterized as a means of elucidating both the disparity and the relationship between ideas and the physical world. The infinitely fascinating tension behind such an aspiration is perhaps most likely what drives them to follow so fervently their chosen paths. Ultimately, in the painting of Lasker and Smith, disparate elements are united to form a most complex polymorphic pictorial reality in a re-invention of traditional easel painting; their achievement in combining such seemingly discordant elements and making them function should not be underestimated. 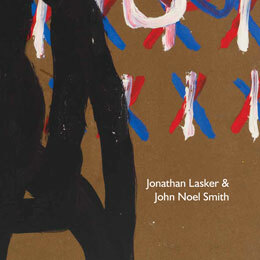 Studies in Paint: Jonathan Lasker & John Noel Smith. Dublin: Hillsboro Fine Art, 2010.